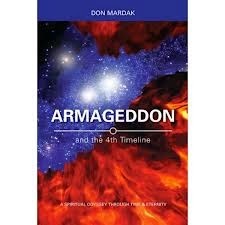 "Armageddon and the 4th Timeline: A Spiritual Odyssey Through Time & Eternity," by Don Mardak, is an impossible-to-put-down mystical fantasy that makes the reader think of deep issues while entertaining with a fast-paced adventure. The plot of the novel is centered on the potential for disaster as a result of conflict between heavily armed factions; this is only a very broad overview, however. The novel is really an intricate web of subplots, involving spirituality, politics, the military, and time travel. One of the exciting things about the novel is that the reader is taken to many different locations, from Hamburg, Germany to Tel Aviv, Israel. The characters in the book are well-written and perfectly relay the excitement of the situations to the reader. The highlight of the book, however, is that it brings together three themes: the war on terror, spiritual teachings, and the idea of time travel. These themes are brought together in a way that creates a fascinating, thought-provoking book. If you are someone who wants a mystical-fantasy book that is incredibly exciting (yet you can also learn from it), then, without a doubt, "Armageddon and the 4th Timeline: A Spiritual Odyssey Through Time & Eternity" is the perfect book for you.